I admit, I have a certain soft spot for textile arts, especially when they don’t fit into just that one category, when it’s used as one part of a larger whole. I first saw Victoria’s work at the Queens Museum and have been a fan since. 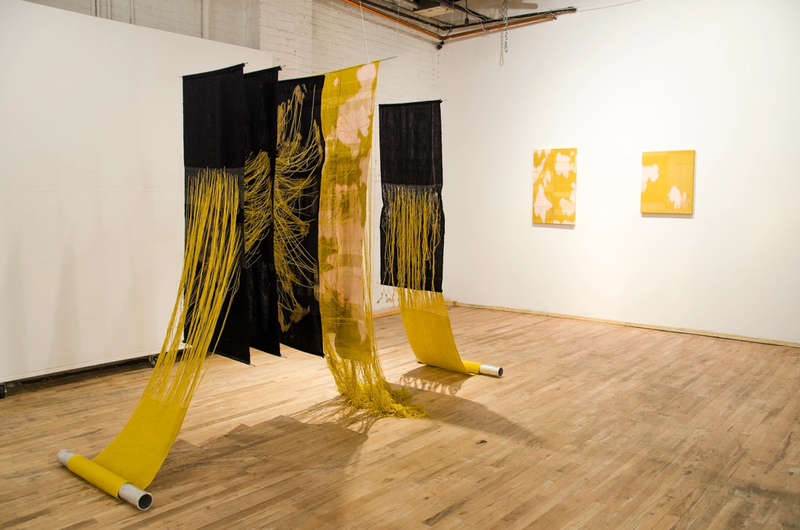 Her work draws you in, using the technique of weaving as a way to conceptualize and push other mediums like installation, new media and painting. I really love her work and can’t wait to see what she does next. I hope you enjoy getting to know more about her and her facinating process! I haven’t heard “blankets” yet — We like to think of them as woven screens. Computer 1.0 is a project I’ve created in collaboration with designer, Julian Goldman. 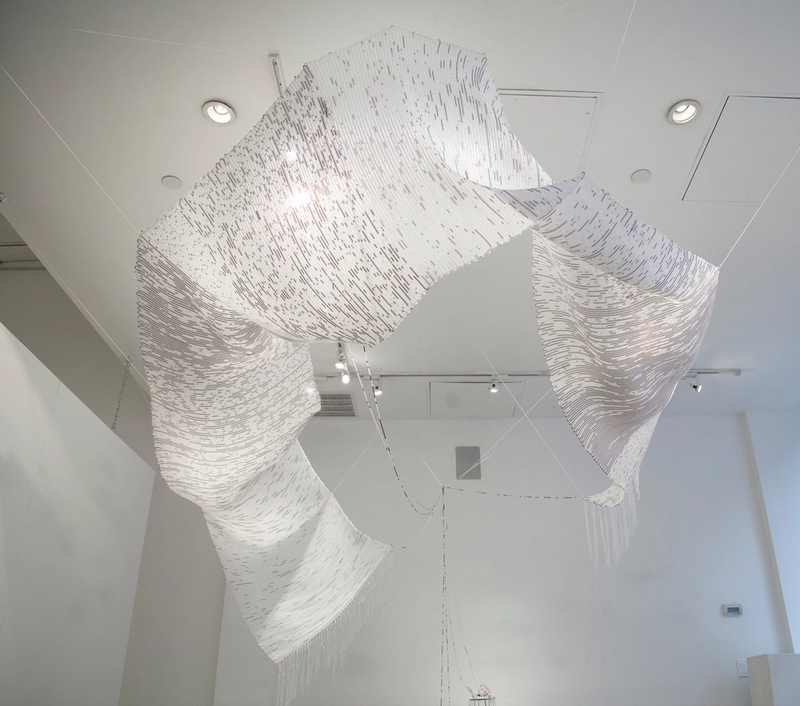 We were inspired and curious about the relationship between the computer and textiles. 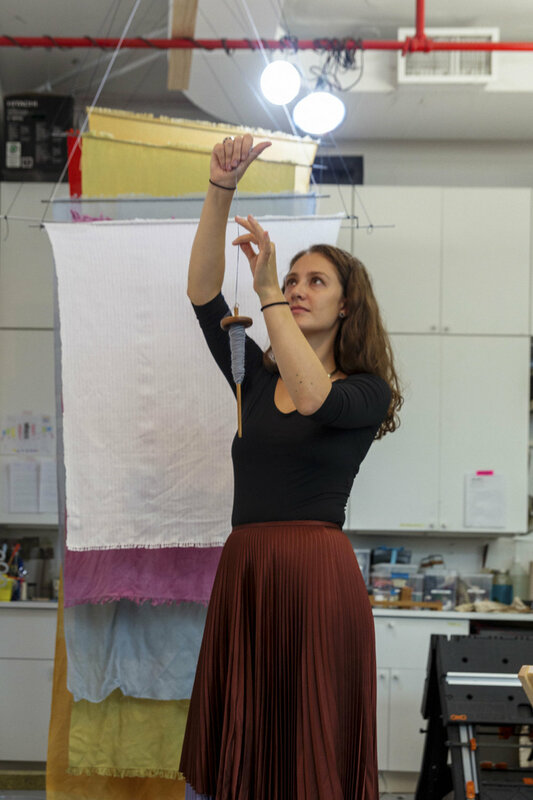 I’m intrigued by the experiences that connect us -- textiles are something all humans understand and experience on a regular basis and they have been that in our lives for pretty much all of human history. But now, technology plays a similar role in our lives. Spending so much time with these two machines that are linked in such a discrete way really pushed me towards exploring it with my own physical interpretation. I was talking to people in my community about this and a friend told me “you have to meet Julian” because apparently he was asking some similar questions in his work. Our friendship began and grew with our collaboration. Julian has more of a technology background and I have a textiles background. Of course, though, those categories are very connected when you look at the history and evolution of our modern technologies. But on a surface, commercial level, they are rarely overlapped. I’m not sure about 2.0 just yet but the project is still very new. The title doesn't exactly suggest it’s the first of more interactions but rather an exploration of technology at the beginning. We are extremely excited for what’s next! Check out her videos of this project on her website! On the side of working with technical, moving parts, we met briefly during the Governor’s Island Art Fair. That installation was gorgeous, the work hung in the stairwell, seemingly floating in space there. So, this is a two-part question, how does location and place change this work for you? And as this installation has that extra technical element, what words of wisdom and advice do you have for anyone interested in diving into these elements in their own work? This project started with the idea - the logistics came second. My work is often guided by my materials. I let my loom and my tools determine the form and the concept build and shift along the path of construction. With Computer 1.0, it's been a slightly different approach and we are still working on how to make it function exactly as we want it to. Each exploration, we find its capable of something we didn’t expect and that takes us down a rabbit hole. We have so many things we want to try! 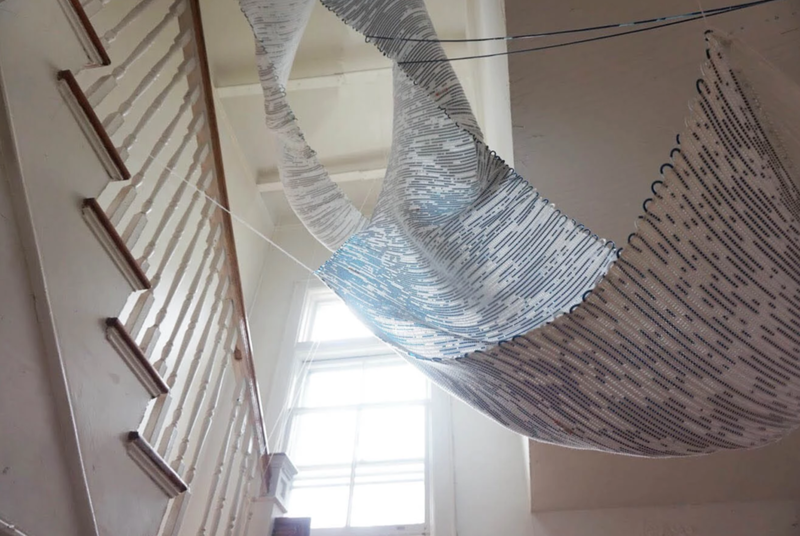 The space and environment can make a huge impact and the governor’s island install was the most dramatic to date with gravity working in full force. We didn’t take gravity into account when we constructed and designed it so this was certainly a learning experience. Site specific art like this always has to adapt to new space which means you sometimes have to make changes or adjustments. Let’s move onto your other installations. These, while there are no moving parts technically visually feel like they do have movement or an element of time in them. Often composed of multiple panels where threads seem to be being sucked into and/or pulled through from one panel to the next, and titles like “Get Me Out of Here” can you elaborate a bit on the inspiration of this work? I’m not employing motion exactly but rather, these works are about movement. The nuance is subtle - perhaps migration is another word to describe them. 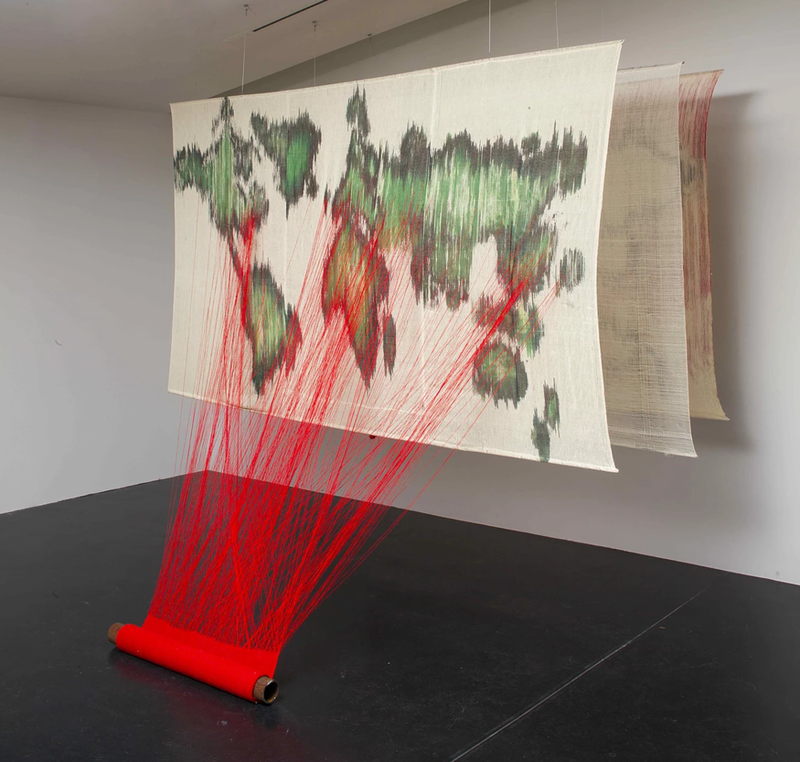 I’m interesting in using thread to make connections on maps, exploring the relationships that exist between spaces and how we are all influenced by our own places on maps. I didn’t move a lot as a kid, actually, but I spent a lot of time on the internet. My generation was the last without and first with internet -- we got it when I was in middle school. And this new tool, undefined and unclear, led me to understand in this curious way about where I am and where I am not. I’d love to ask you about the color choices and imagery of this series. Sometimes you use a vivid red or a bodily mustard yellow combined with these map-like panels. They’re very powerful. What was the catalyst for this series of work? Was this your first dive into three-dimensional work/installation vs the paintings? As with nearly all of my work, I really let the materials guide me. The colors and materials, many of which I’m making by hand and with both natural and synthetic materials determine the conceptual side of the work just as much as the reverse. No, it's not the first three-dimensional work. I’ve been making this way since art school! But you need an exhibition or viewing space to make installation art whereas the paintings are a product of meditation and a regular studio practice. Which, you also do paintings! Your paintings are a wonderful combination of textile art meets painting. I love how you bring to the forefront how the painting surface is a part of the creative practice and artistic choice. They are sometimes on stretcher frames and other times allowed to have an a-typical shape and no frame at all, what makes you choose to go one way or the other? Because I’m working with handmade materials, they often have irregularities, uneven edges or variances in shape and color so I often use these happenings to inform the structure of the piece- the stretcher bars, the platforms I make or the installation. I don’t often have a “format” in mind when I begin and many of these pieces remained unfinished for years with only that final formation to be determined. There are some that are a bit translucent with shaped frames, are these the newest of that series? These have a similar sensitivity to light that the “Computer 1.0” works have. Is there a conceptual purposed behind this transparency and luminosity? Yes, those framed pieces are some of my newer pieces. I am very interested in materiality and this, perhaps, is an exploration of bringing fiber together with wood. I use natural and synthetic materials and also like to push beyond the “soft”. I suppose it's about exploring what is possible. I love making my own materials because I get to see them transform. It takes a lot of tools, time, and external elements but at the end of the process, the components are the same. For example, when I spin yarn, I start with fiber from an animal or plant and then I need a suspended spindle, time, pressure, moisture, patience...a chair, a light...and then eventually its yarn before I again employ water, pressure, heat, time, space, organic and chemical materials...and then it has color. So much transformation transpired but its still the same. Working with a hard material complicates this because I can’t manipulate it as easily with just my hands but it's still a part of that timeline. Especially when I’m using rayons that are made with wood pulp materials. It's just another stop on the journey. My favorite artists are my friends - having a community of makers in my life has been really important to my personal development. We share ideas and techniques and often, space and tools. I’ve done residencies and projects from which I’ve made lifelong friends. A few of my collaborators: Yto Barrada, Marlene Stanciu, Abigail Doan, Alex Goldberg, Maeve Broome, and many others. Also I have a huge admiration for artists Julie Mehretu, Mark Bradford, Joan Mitchell, Anni Albers. Do you have any current or upcoming events that you’d like to share? I’m an artist in residence at MAD museum this term, until February 2nd! I’m also in a few group shows within the next year and especially excited for “Soft Territories” at Knockdown Center in summer!